I’ll be leaving in a couple of days; I have been in Iran for two weeks now. How easily we are able to change our habits. Two weeks and I now feel uncomfortable going out in public without my hejab, kebabs have become my staple diet, and salams and merci come easily. One more week here and I would be all chadored, going na na every time someone wanted to take a picture of me. Travelling through miles of desert is an extraordinary experience. It also teaches you not to be fussy. Bathrooms are invariably behind a sand dune, at a little booth in a caravanserai, or in a thicket. So when you emerge you learn to check your front and backside as well so that there are no twigs sticking out of your hejab. It gives a whole new angle to the “going to the ladies” ritual. 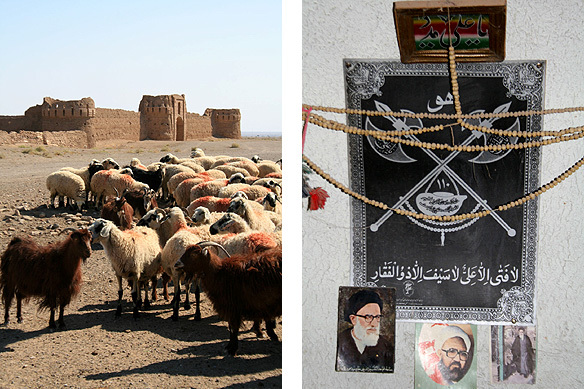 There are two main deserts in Iran—Dasht-e Kavir and Dasht-e Lut—and they are both dotted with tiny little towns built around ancient mosques. Nain is the most charming with its carpets and 9th Century Jameh mosque decorated with stunning yet simple stucco-work. Iran is the only Shiite Muslim regime in the world with 89 percent of its population Shiite. Freedom of worship is, however, guaranteed in the constitution. A popular part of the Shiite religion is the representation of its Imams (religious leaders), with images of the Imam Ali and Hossein, in particular, appearing nearly everywhere, in shrines and homes, and on fridge magnets and calendars. The 9th Century Jameh mosque in Nain. A stop en-route at an age-old caravanserai. 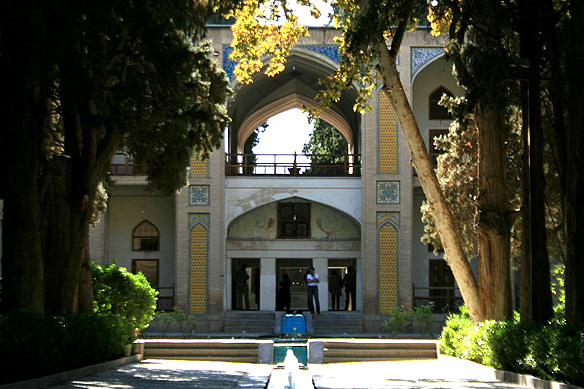 Abyaneh is on the way to Kashan, my destination for today. Nestled at a height of 2,500 meters on the slopes of Mount Karas, this ancient compact red mud village is recognized by UNESCO for its antiquity and uniqueness. It is populated by angelic children offering biscuits, rickety old women with grizzly beards who scold and wave me away because I have no money on me to buy their home-made snacks, and old men going about the business of earning a living. 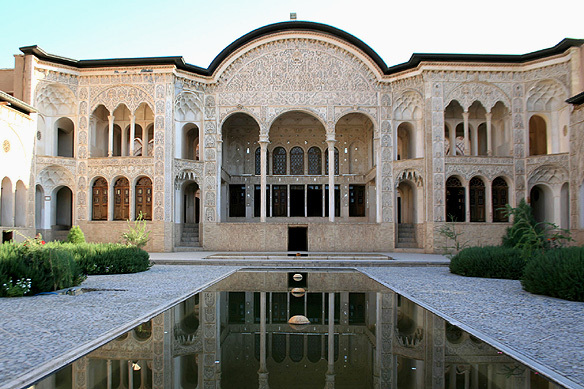 Most of the original structures date back 500 years to the Safavid period. 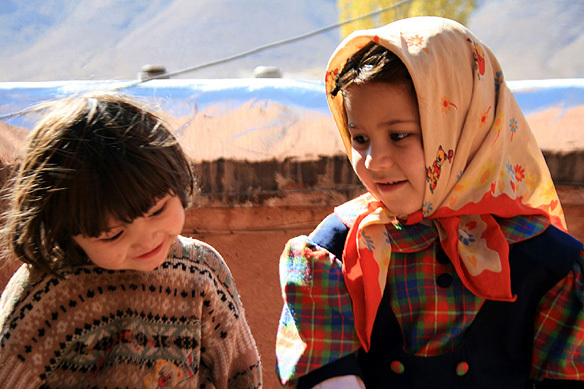 The villagers still wear distinctive floral scarves and speak Middle Persian, a dialect long since disappeared elsewhere. The village is actually very pretty. And the grizzly old women remind me of my grandmother. I think it is the nose. 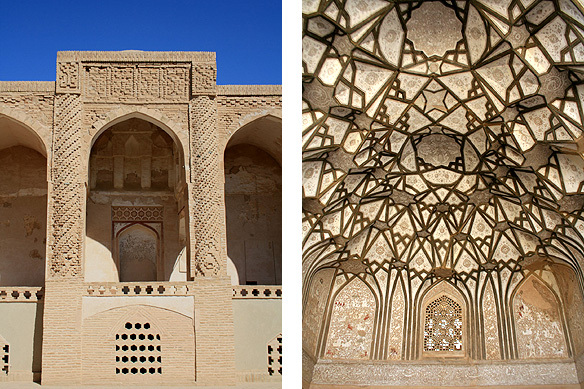 Historic Kashan on the other hand is sprawling both in time and scale, spread out over a dusty expanse in the middle of nowhere. It was from Kashan that the Three Wise Men are believed to have started their journey to Bethlehem. Both, the 5,000 BC Sialk ziggurat with millennia-old skeletons and the serene Fin gardens with tree-lined fountains, are worth a visit. 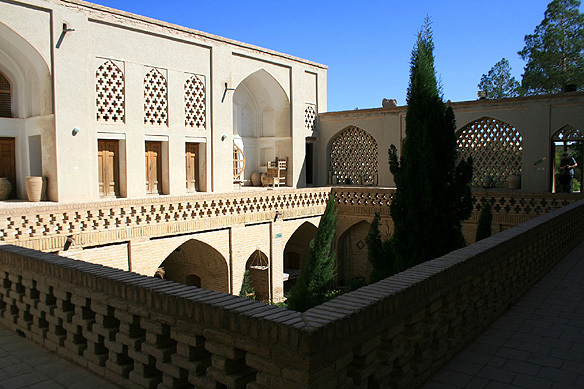 The oasis town’s main attraction, though, are its beautifully restored Qajar-era mansions. 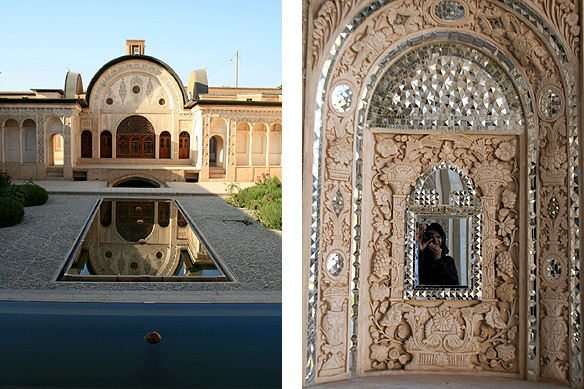 I visited Khan-e Tabatabai, the home of a 19th Century carpet merchant famous for its carved reliefs and mirror-work. It is always wonderful to be rich. In any century. 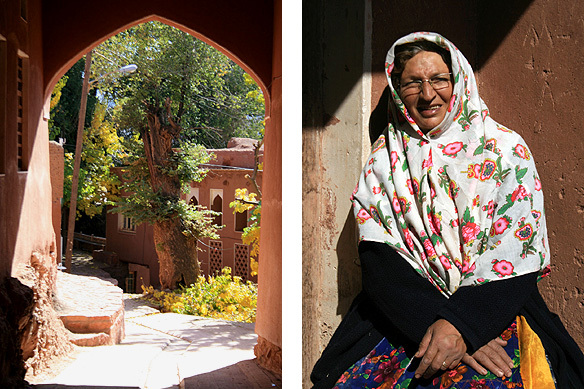 Like all Iranian towns, Kashan too has its heart and soul in its bazaar. I am, moreover, getting pretty good at passing myself off as an Iranian by now. 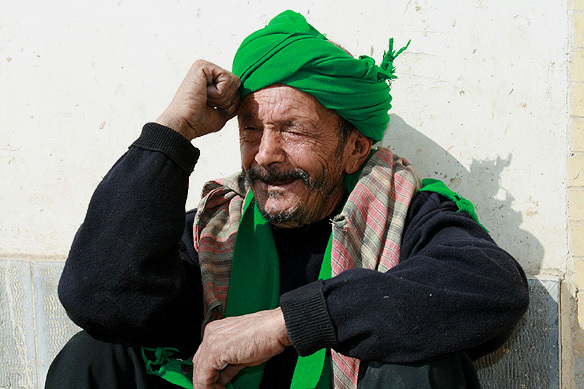 When people stop me and chat with me in Farsi, I instantly nod, and smile and go bale (yes) and na, though at times I wonder what am I agreeing to and what am I disagreeing to. But then they look at my heavy duty boots, my SLR, and my grin, and they start laughing. “No Irani?” “Na.” And I get a big smile and free pistachios for that. It has been such a wonderful two weeks. As I sit and have my last chai at a local chaikhana down the road from Kashan’s only hotel where three beds are cramped into my single room, I feel kind of sad. And happy. Happy that I had listened to my heart and made this journey. Sad, that there are so many walls between my world and theirs, and that once I left, if and when I would be able to return again. And ancient ziggurats … But the best is the tea-house down the road from the hotel; awesome, awesome chai. Left: Self-portrait. This entry was posted in Exploring our World, Iran and tagged Abyaneh, Imam Ali, Imam Hossein, Iran, Kashan, Middle Persian, Nain, Qajar Shahs, Safavid, Shiite Islam, Sialk Ziggurat, Things to see in Iran, Three Wise Men, UNESCO World Heritage Site by Rama Arya. Bookmark the permalink. Non-Irani passing off as Irani? Congrats! It’s a great series, Rama. 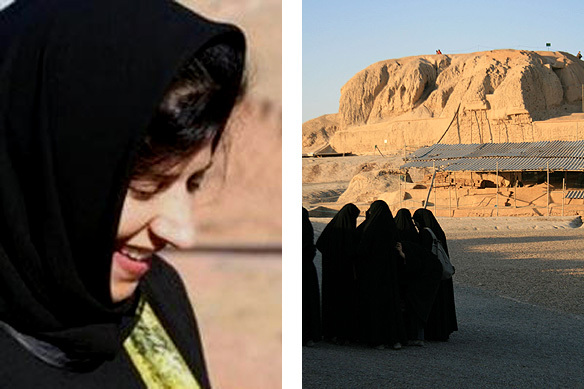 I haven’t come across many bloggers who uncover Iran like you. Well, a heritage buff certainly has a different style. Right?